LONDON/FRANKFURT (Feb 27): The London Stock Exchange has all but ended a planned merger with Deutsche Boerse to create Europe's biggest stock exchange by ruling out meeting a European antitrust demand, saying it has strong prospects alone. In a bid to create a European trading powerhouse that would better compete against US rivals making inroads on their home turf, the two exchanges struck a 29 billion euro (US$30.1 billion) deal just over a year ago. 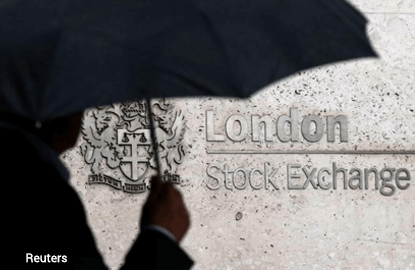 But in a highly unusual step, the London Stock Exchange (LSE) on Sunday preempted a European Commission antitrust decision, saying it was unlikely to give clearance for the merger after the London bourse had refused to sell an electronic trading platform in Italy. The exchange added that it would still work to make the merger with Deutsche Boerse succeed, but that would be impossible unless the Commission, which declined to comment, changed its position. The plan to create what the head of Deutsche Boerse dubbed a financial bridge between continental Europe and Britain, had been called into question by Brexit, with German politicians demanding Frankfurt not London be the headquarters of the group because Britain would be leaving the trading bloc. Deutsche Boerse said that decision not to sell the MTS trading platform had been made by the LSE, adding that it expected a decision by the Commission by the end of the month. Shares in Deutsche Boerse slipped by more than 2% at the opening of trading in Frankfurt on Monday, while LSE stock was down by about 1%. The LSE had said in a statement late on Sunday that the Commission had asked it to sell its 60% stake in fixed-income trading platform MTS to satisfy antitrust concerns over the merger of Europe's two largest market operators. Calling the request "disproportionate," the British exchange said it believed that it would struggle to sell MTS and that such a sale would be detrimental to its business. "Based on the commission's current position, LSE believes that the Commission is unlikely to provide clearance for the merger," it said. The exchanges had already agreed to sell part of LSE's clearing business, LCH SA, in order to satisfy antitrust requirements. LSE said the Commission had also raised concerns this month about the impact on the European market landscape of access to bond and repo trading feeds were the two exchanges to merge. LSE said it had offered certain proposals to address this but that the commission had requested they sell all of MTS instead. MTS is a small part of LSE's business but it said it was a major platform for trading European government bonds, particularly in Italy, and that it was "systemically important". LSE said that such a sale would need regulatory approval from several governments in Europe, and it would be detrimental to its wider Italian business. "Taking all relevant factors into account, and acting in the best interests of shareholders, the LSE Board today concluded that it could not commit to the divestment of MTS," the exchange said.